Set in the previously sleepy hinterlands straddling Washington state and British Columbia, Border Songs is the story of Brandon Vanderkool, six foot eight, frequently tongue-tied, severely dyslexic, and romantically inept. Passionate about bird-watching, Brandon has a hard time mustering enthusiasm for his new job as a Border Patrol agent guarding thirty miles of largely invisible boundary. But to everyone’s surprise, he excels at catching illegal immigrants, and as drug runners, politicians, surveillance cameras, and a potential sweetheart flock to this scrap of land, Brandon is suddenly at the center of something much bigger than himself. 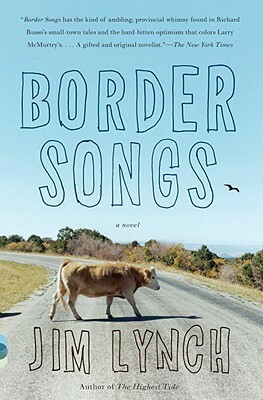 A magnificent novel of birding, smuggling, farming and extraordinary love, Border Songs welcomes us to a changing community populated with some of the most memorable characters in recent fiction. Jim Lynch lives with his wife and their daughter in Olympia, Washington. As a journalist, he has received the H. L. Mencken Award and a Livingston Award for Young Journalists, among other national honors. His first novel, The Highest Tide, won the Pacific Northwest Booksellers Award, appeared on several bestseller lists, was adapted for the stage and has been published in eleven foreign markets.